Baseball and softball could be included in the 2020 Tokyo Olympics. But how about korfball, billiards or even American football? 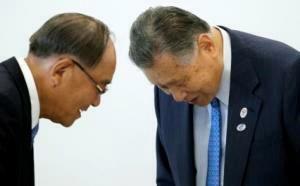 Tokyo 2020 Olympics President Yoshiro Mori, right, bows with Tokyo 2020 Olympics chairperson Fuji Mitarai. TOKYO　AP - Tokyo organizers on Friday released a list of 26 sports that that have applied for inclusion in the games. Some were familiar why others like surfing, wushu or sumo could give the Olympics a unique look. The combined bid of men's baseball and women's softball is considered a favorite because of the popularity of those sports in Japan. Other federations that hope to have their sports added to the program include karate, squash and roller sports. "We have three criteria in deciding which sports will be chosen," said Toshiro Muto, chief executive officer of the Tokyo organizing committee. "They must be popular with young people, give momentum to Tokyo 2020 and meet IOC standards." Tokyo will announce a shortlist of candidates on June 22. Finalists will make a presentation in Tokyo in August, and organizers will make recommendations to the International Olympic Committee by Sept. 30. The IOC will make a final decision in August 2016, when it meets ahead of the Olympics in Rio de Janeiro. IOC President Thomas Bach said earlier this week that he wants sports with youth appeal. "We would like to see in the proposals also an event or events which are attractive to youth in particular," he said in Lausanne, Switzerland. "We think that this would be a win-win situation. It would give Japan the great opportunity to present itself to the world as a youthful nation looking to the future embracing youth and other cultures." "I am confident that this call for youth in the Olympic Agenda 2020 will be reflected in the proposal we are going to receive in September," Bach said. Muto also said sports which would not require new venues to be built are preferred. Tokyo Olympic organizers have been looking for ways to reduce costs. Baseball and softball were dropped after the 2008 Beijing Games and have failed in several bids for reinstatement. They would be a huge draw in Japan. "Baseball and softball at the Tokyo 2020 Games can help spread Olympic values with the entire nation of Japan and those around the world," said Riccardo Fraccari, president of the World Baseball Softball Confederation. Many of the sports up for consideration have been applied for Olympic inclusion in the past, some multiple times.